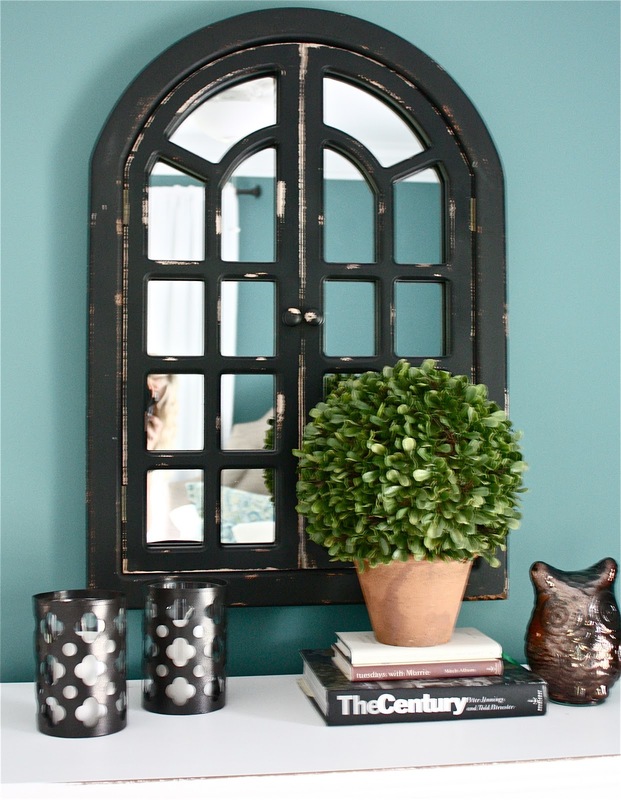 I know I've said this before, but I mean it every time…this is one of my favorite room transformations. When Erik and Sara called upon me to help with their guest bedroom, their main complaint about the space was that it felt "unfinished". Individually, they had great pieces (an upholstered headboard, a beautiful duvet, a rich brown leather chair and a dresser with sentimental value), but they weren't happy with the way these items looked together. After a brief consultation, I got to work creating a custom design plan for their space using their existing pieces as the basis of the design. Color, pattern, texture and carefully chosen accessories were used bring their existing pieces (the bed, duvet, dresser and leather chair) together in one cohesive, finished, custom design. 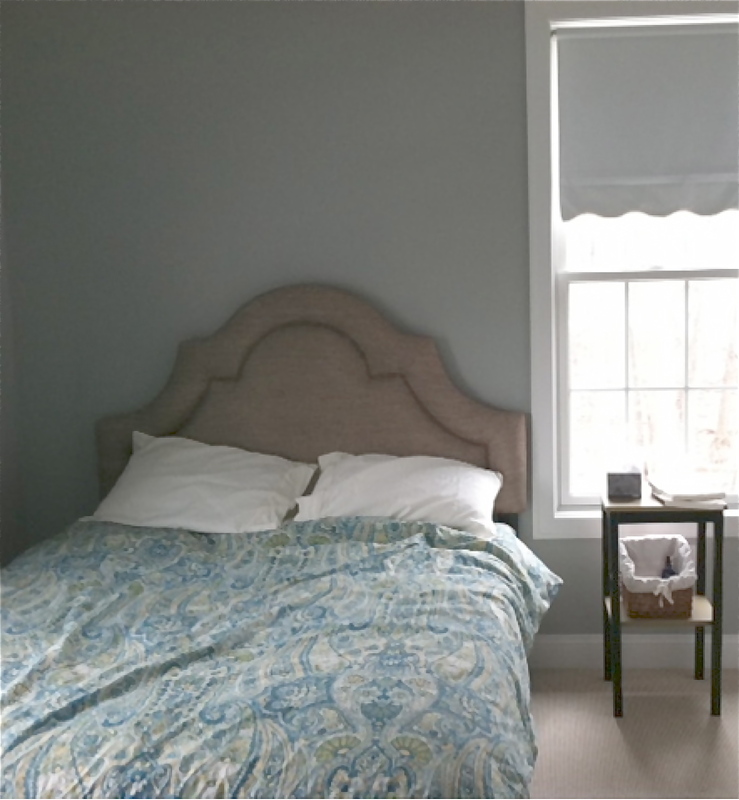 The plan included a dresser makeover project, new window treatments, additional bedding layers, custom paint color selection, new hardware and fun accessories. These beautiful candle holders and clear lamp base were already owned by the client, tucked away in a closet. The translucent quality of these pieces made them perfect for the nightstand in front of the window. Together they create a non-view blocking table top vignette. Speaking of the nightstand…it was built by Sara's father to coordinate with the dresser that received a makeover. 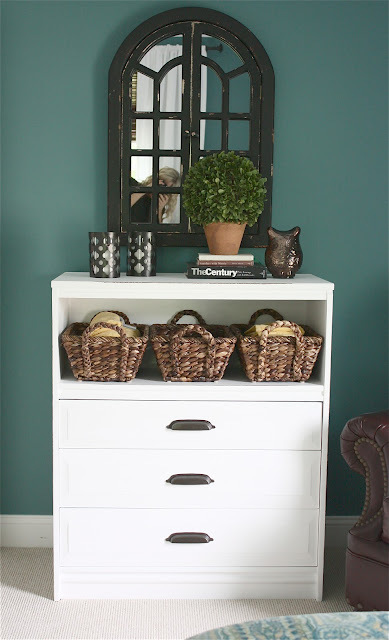 The top drawers of the dresser were removed to make room for storage baskets followed by a crisp white paint job, subtle distressing along the edges, and new hardware. 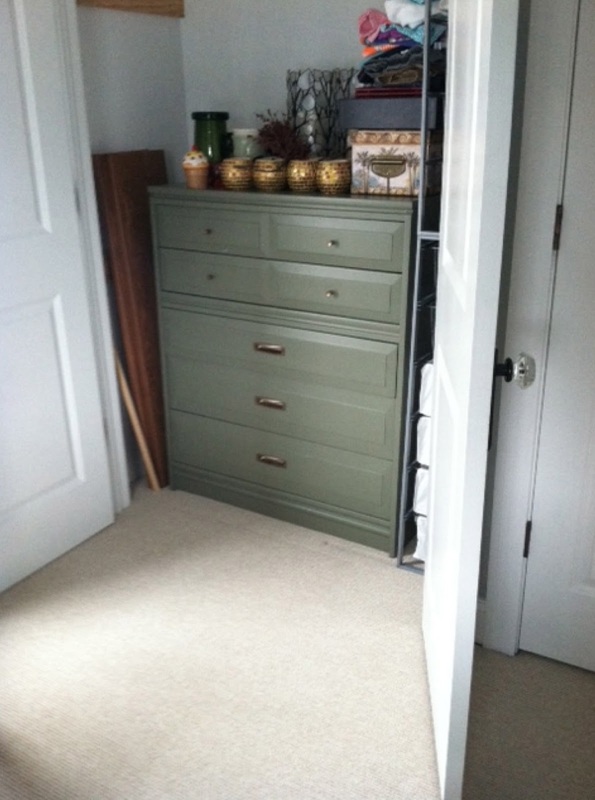 Instead of purchasing a nightstand with a similar look, her Dad offered to build her one. How lucky are you when your Dad can whip up a gorgeous piece of furniture at a moments notice? Pretty lucky! 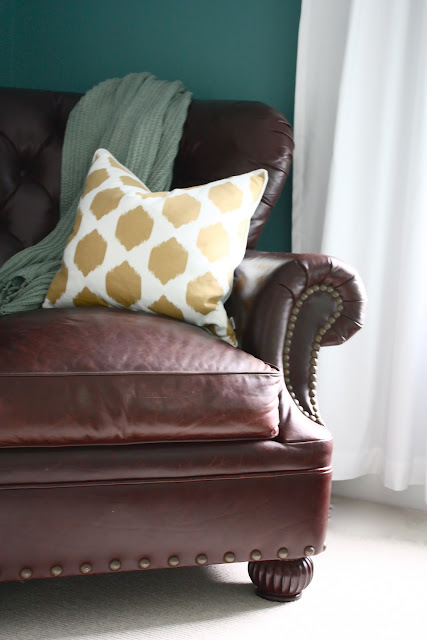 I tied their brown leather club chair into the design by incorporating dark roman shades layered under drapery panels and dark storage baskets inside the furniture. All of these rich brown accents provide amazing contrast to crisp white furniture, drapery and bedding. Pops of muted yellow found in guest towels, family photos, pillows and lampshade are fun and unexpected. The new custom paint color selection provided drama. The amazing moldings in this room are now highlighted by this fabulously rich will color. 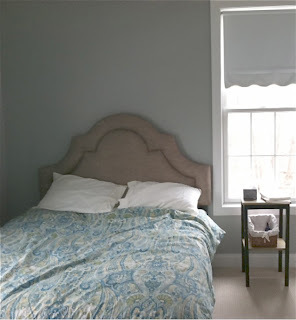 This project a great example of how a room can still feel light and bright despite using a dark wall color. 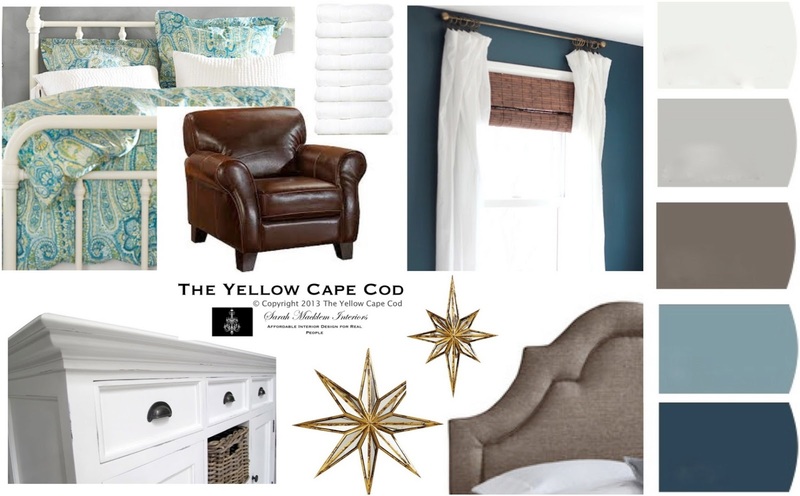 Thank you, Erik and Sara for giving me the opportunity to create a design plan for your guest room. 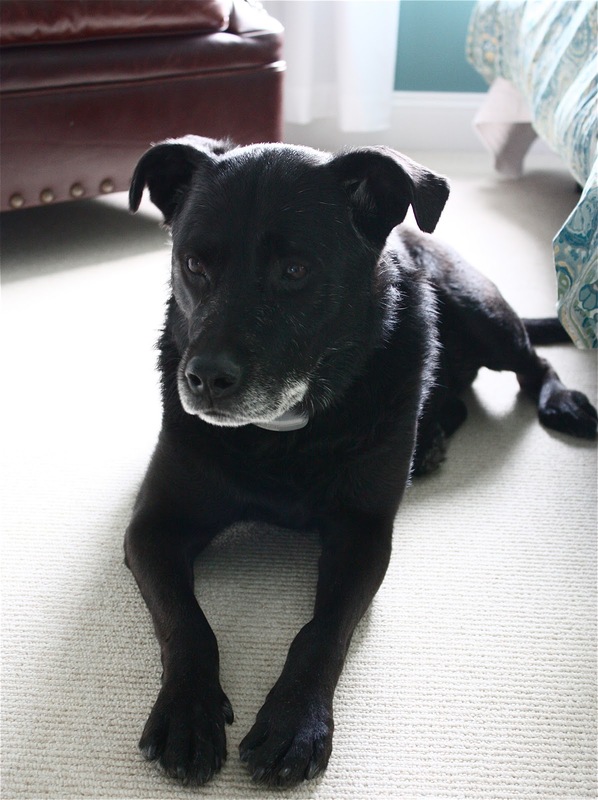 Your home is exceptionally beautiful and it's been a pleasure working with you. I hope your guests enjoy their cozy new digs. Click here to reserve your very own affordable custom online design plan. This is beautiful! 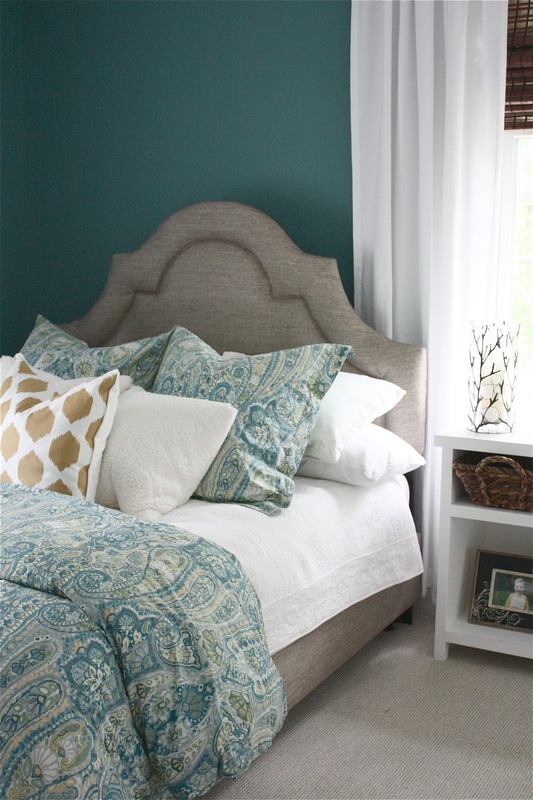 I'm working on my guest room with a very similar idea/color scheme. I LOVE the dresser update. When you removed the drawer, did you have to build some type of bottom for the baskets to sit on? It's gorgeous! I can only hope that mine turns out as pretty as yours! 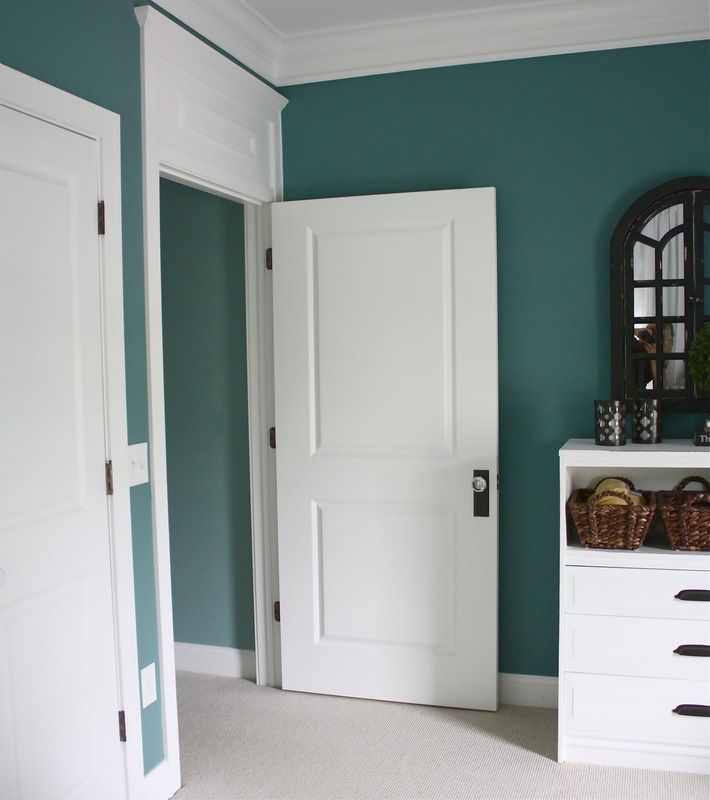 I love the paint color and the bronze door knob plates! Beautiful job! Quick question-- where was the duvet purchased? (I know the homeowners already had it) I LOVE it! Gorgeous! 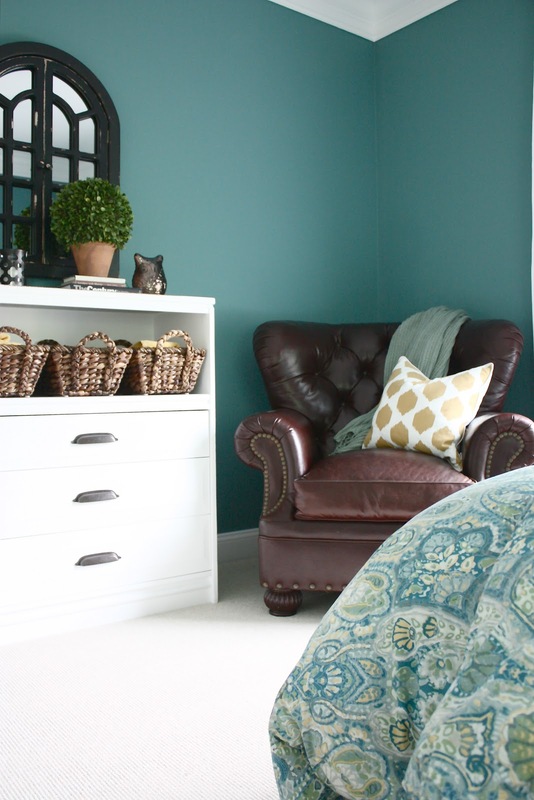 Can you reveal the name of the Paint color?? Perfect shade! Beautiful job! You are so talented! I love the bedding. Where did you get it? It's the Rosalie paisley from pottery barn. That's the duvet! I don't think so. The Rosalie is red and orange. It looks more like the Sienna or Ashlyn paisley to me. Nevermind, you're right. The Rosalie used to come in blue too but it is no longer available. Sorry. I love this! It is absolutely perfect. Beautiful! Any ideas on guest room in basement no close windows? This room is so beautiful! Where is that palladium-esque (I'm just creating my own words here) mirror from?? Exactly what I have been dreaming of in our master bedroom! Thanks! Love, love that room...the wall color is beautiful!!! Gorgeous job!!!! You have such an amazing talent! I love following your blog and came across this room...do you know the white paint color used to refinish the furniture? If not do you know of any good white paint colors that are good for refinishing furniture? Beautiful job Sarah! Love the details. Love the room. Is it possible for you to say where the lamp came from. Beautiful room............is it possible to say where you got the lamp? What a transformation! I love the wall color! Where did you find those door knobs?? To die for!!! 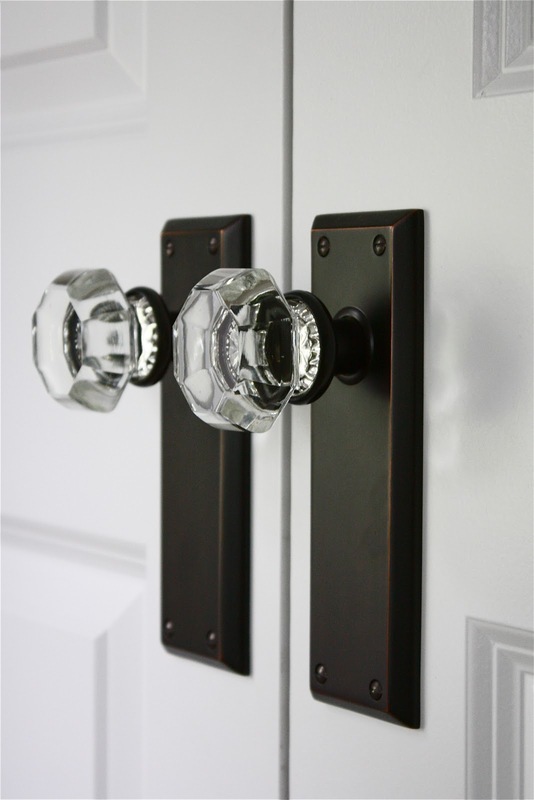 I second Lisa Marie Wells question about where to find the door knobs :) They look "new old" meaning you wouldn't have to retrofit an old knob to a new door. Also sorry if this appeared twice. I was trying to preview my comment and it just disappeared.